Chic and spacious, the baroque COMMODE Golden wood is made in solid beech, with fittings in bronze gold and rewarding to an assemblage of dovetailed drawers. With a strong and valuable wooden structure, including here massive, Golden beech with aluminum gold color leaves, this sumptuous Golden baroque Dresser provides excellent storage with its two large drawers. His edits are performed according to the rules of the traditional art of tenons and mortises. Inevitable in terms of storage, dressers are types of low-rise furniture, with wide drawers to put some order in your home. Both useful and decorative, the baroque COMMODE shows all the main features of the collection of furniture art deco of a certain era. In fact, furniture barocco, a native concept of a Portuguese term "barocco" meaning literally "rare Pearl" are part of the styles of furniture that appeared around the second half of the eighteenth century, succeeding classical styles. It's very stylish indoor furniture, gracing past castles or the Royal Palace. For a unique and luxurious such piece, decoration furniture, Louis XV is well suited. Until now, these types of furniture were able to keep their reputation in terms of practicality and opulence, allowing them to dress up your interior in a way high range. A Cabinet inspired by this style is characterized by various elements including its basic material, shape and trim. This Louis XV commodes model consists of a structure in beech, representing the very ostentatious style with egg wash. The gold effect, used the aluminum sheets of color gold, applied by hand with a brush of silk. This action is visible on the surface of the furniture, giving it a wonderful authentic appearance. Not to mention his good size who can fill the empty spaces cleverly by reign of the order in your home. This cheap baroque Dresser is perfect to provide a not too bulky decoration in the style of the renaissance home. 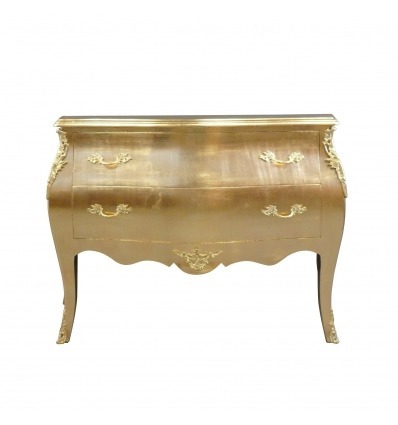 With a timeless beauty, the baroque COMMODE has curved legs, a detail inspired by the Louis XV style. It is offered with two generously sized drawers assembled with the dovetailed guaranteeing an efficient storage and offering the opportunity to squeeze maximum business. Made with a massive, valuable and solid wooden structure, this cheap baroque Dresser is well suited to intensive use. Its curved shape and its curved amounts recall distinctly all the elements of the baroque style. In order to complete the chic, the toppings are made finely chiselled gilded bronze (handles, feet, leg). For a luxurious décor, the baroque style Dresser offers a large storage space regardless of the look of your home. Its authenticity and originality to adapt to different styles, from the oldest to the most modern. This piece of furniture will fit perfectly in any room of your home: the office for filing, the bedroom to put linens, the living room to deposit a fixed phone, cooking for put away the dishes. He can also take the role of a console near the entrance to leave keys or some objects that you find at hand. This wider model has a higher structure and more pronounced ornamentations. With its large drawers, it is more preferable to serve as convenient room. Also adopt other furniture of the same style to improve the tone of your decoration.